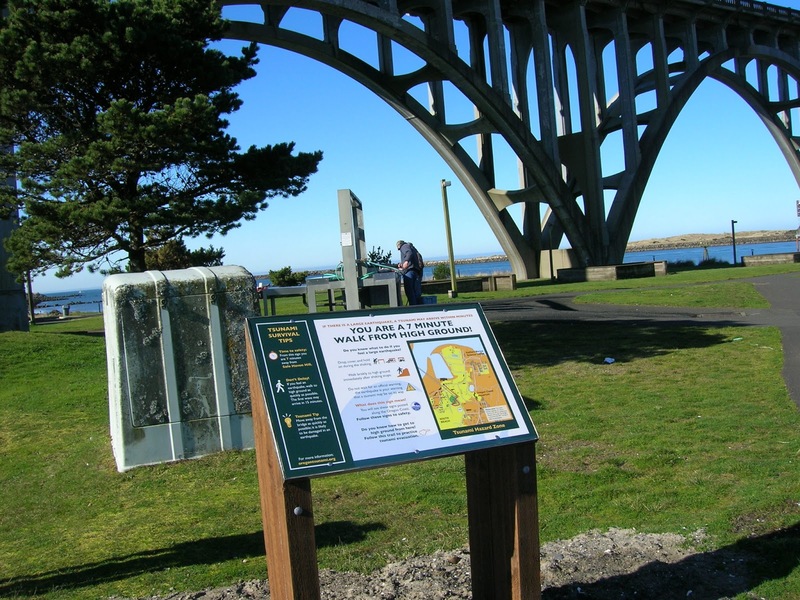 Last week, I hiked Newport’s new tsunami interpretive trail that leads from the Hatfield Marine Science Center to what is being called “Safe Haven Hill,” a little rise that has been designated as the gathering place in case of a tsunami for people who live and work along the south shore of Yaquina Bay. 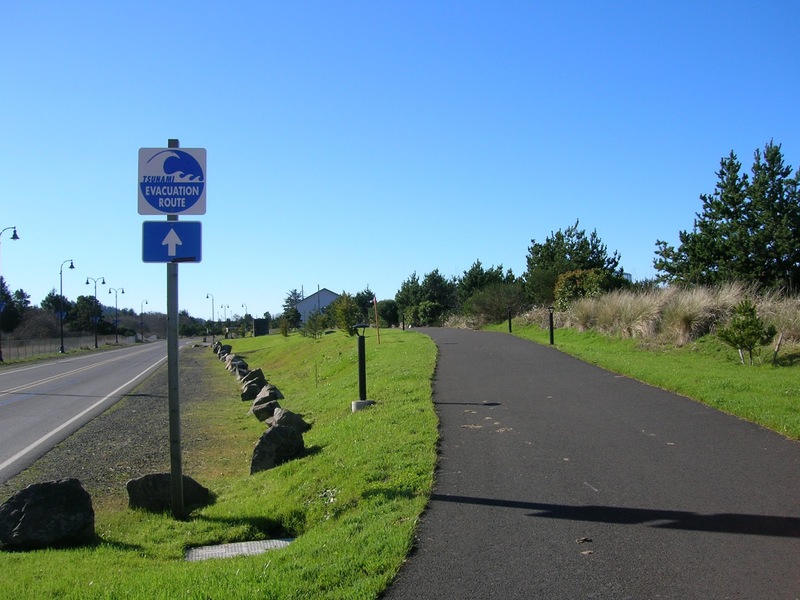 It was a beautiful sunny day, and I enjoyed an easy walk along a paved path with informational signs that talked about tsunamis and let walkers know how many minutes they were from higher ground. I passed the boat launch, the RV park, and the marina, where folks were setting up tents for next weekend’s seafood and wine festival. I passed the Rogue Brewery, a bus stop shelter, sinks where two men were cleaning fish, and old concrete restrooms. I followed the signs south to the foot of the bridge and then I . . . got lost. Where was the sign to tell me where to go next? What if the tsunami came now while I was trying to figure out the map? My walk had brought me closer to the beach, not farther away. I climbed up the steps to the bridge, climbed back down, walked under the bridge, climbed up the other side, climbed back down, drove south and parked near a hill I had climbed before, and climbed it again. There’s an old cemetery up there, but I don’t think that’s Safe Haven Hill. It’s a rugged climb, and it would be crowded with 10 people. Where would they put the hundreds, maybe thousands of people coming out of Hatfield, the Oregon Coast Aquarium, the National Oceanic and Atmospheric Administration complex, the marina, the RV park and the brewery, all of which would be in the path of a tsunami? Maybe it was the hill across the exit ramp, all sandy and smooth, with a no-trespassing barrier and a sign that proclaimed it the property of the Oregon Transportation Department. A recent article at News Lincoln County clears up some of the mystery. Folks are still working on creating a smooth trail up the hill on the north end and a gravel road on the south side. Fortunately, the people who work in the zone have practiced this walk, and if the earth starts shaking, they will know exactly where to go. I just hope when they get up there, stranded for hours on a hill while the water goes crazy below, there’s a restroom and maybe something to drink. I don’t live in the tsunami zone, but who knows where I might be when it hits? People are thinking a lot about tsunamis here on the Oregon Coast these days. It’s hard to miss the blue and white signs along the highway that let one know one is entering or leaving a tsunami hazard zone. Signs at our state parks alert beachgoers to carefully collect and bag debris washed up on the sand from the March 2011 tsunami in Japan, reporting anything too big to put in a bag. Mostly what we see is bits of foam rubber and the occasional plastic bottle, but we have had a massive dock arrive at Agate Beach, and about two weeks ago, a barnacle-covered fishing boat washed up on the Salishan spit near Lincoln City. So tsunamis are on our minds. I walked the trail at 11 a.m. on a sunny day. What if the tsunami hits at night during one of our frequent storms? What if the power is out and all those lovely lights along the way are dark? I guess that’s why people practice heading to higher ground. Tee shirts available in local gift shops say “Tsunami evacuation plan: run like hell.” That’s pretty much the drill. First, during the earthquake that is likely to precede the tsunami, duck and cover. When the earth stops shaking, go immediately to higher ground. Do not stop to gather your things or wait for an official warning. If it’s a 9.0 or bigger quake close to shore, you will only have 15 to 20 minutes before the tsunami hits. You can find tsunami evacuation maps and other information at http://www.oregongeology.org/pubs/tsubrochures/NewportEvac.pdf. Let’s pray the tsunami never comes, but at least now I know where to start.